This past Solstice Wassail (for annual MUNDI Presentation) I created a backdrop for the stage. 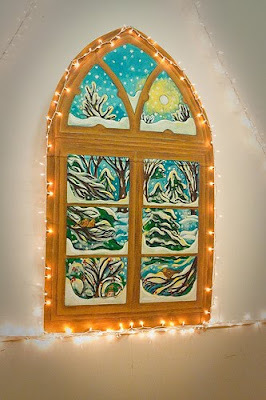 Recreating the shape of the windows in the chapel, a snowy scene was depicted outside, complete with birds and even a little elf. The play was done on stage this year with the band "Bucolics Anon." off to the side. The "faux" window was made using canvas glued to shaped foam core.